Well, I am still out of the studio (will be for another couple of weeks) but new work should have arrived at the Grovewood Gallery in Asheville. Lots of appropriately beautiful yet extremely functional work ready to be put to good use! On the pottery perusing level, I have been following Sequoia Miller's blog (look at the May 12 post for pictures) about these cool boxes he is putting together for a show. I love the concept of grouping many objects together, so that the presentation is a story all it's own, but individually you can OWN just one piece or make your own grouping with two or three. Also found a great book by Peter Cosentino called The Potter's Project Book, which has things like salt pigs, chess sets and other delightful projects, even a puzzle jug. 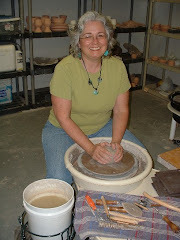 Some inspiring ideas for when I get my hands back in clay. Isn't it crazy how fast the year is heading towards the halfway mark?